It was an unconventional job for women at the time. But for Rosa Lea Fullwood Meek Dickerson, flying was a way of life. She began flying in her early teens at her father’s flight school in McAllen, Texas, and helped out with the flight school operations, doing work in the office and even gassing up airplanes when needed. By her early twenties, she had made history as part of the first group of women to fly military aircraft for the United States, the Women Airforce Service Pilots (WASP). When their country went to war, the WASP reported for duty. More than three decades before women in the United States were allowed to attend military pilot training with full military status, they climbed into cockpits of the nation’s military aircraft to serve their country as pilots during World War II. Dickerson was one of the 1,102 women who served as WASP, flying every sort of aircraft in the United States to release male pilots for combat duty overseas. The women encountered skepticism from some of their fellow pilots, but they proved themselves with expert flying and paved the way for the integration of women pilots into the American armed services. Their story has inspired pilots, astronauts, and legislators, and now all 17 female members of the Senate have cosponsored a bill to recognize these women for their service with the Congressional Gold Medal of Honor, the nation's highest civilian award. Congressional legislation is required to make the medal, and two-thirds of each chamber must sign on as cosponsors. Sen. Kay Bailey Hutchison (R-Texas) and Sen. Barbara Mikulski (D-Md.) took the lead on the bill, S.614, which is approaching the 67 cosponsors required to be reported out of committee; companion bill H.R.2014 is gaining cosponsors in the House of Representatives. To track the progress of the bills and see who has signed on so far, see the blog on the subject. 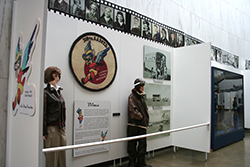 The bill honors the WASP for flying fighter, bomber, transport, and training aircraft, calling the WASP story “a missing chapter in the history of the Air Force, the history of aviation, and the history of the United States.” The WASP flew more than 60 million miles for their country during the program’s short tenure, from its inception in 1942 to Dec. 20, 1944, when the WASP were quietly disbanded. The United States entered World War II at a time when few Americans had even ridden in an airplane, let alone learned to fly combat missions. In the first few months, the nation faced a shortage of combat pilots. 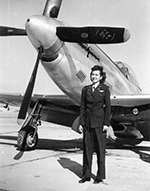 America’s premier woman pilot, Jacqueline Cochran, convinced Gen. Hap Arnold, Chief of Army Forces, that “women, if given the same training as men, would be equally capable of flying military aircraft and could then take over some of the stateside military flying jobs, thereby releasing hundreds of male pilots for combat duty,” the bill states. Cochran recruited the best female pilots in America, accepting only women who had proven their resolve by accumulating significant flying time before they entered the program. More than 25,000 women applied for training, but only 1,830 were accepted and took the oath. “Most of the women really sacrificed to get enough flying in order to qualify to go into the WASP,” Dickerson said. 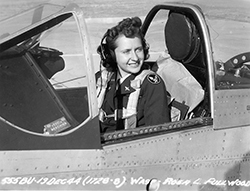 Like many future WASP, Dickerson was invited to the program by Jacqueline Cochran and reported for duty in Sweetwater, Texas. She graduated from flight training in August 1943 and joined the Fifth Ferry Command in Dallas, Texas, transporting aircraft to points of embarkation such as Newark, N.J., and Long Beach, Calif. The women flew all sorts of aircraft, including the B-17, C-45, C-47, P-39, P-40, P-47, and P-51. They risked their lives on difficult and risky assignments, and not all of them walked away. Thirty-eight women died during their service. The families received no benefits because the WASP were not considered military. The WASP paid their own way home after their service and did not receive veteran’s status until Congress granted it 1977. For many of the WASP, the recognition was long overdue. But Dickerson said the opportunity to serve as a WASP was enough for her. The program gave her and the other WASP educational and military opportunities that American women wouldn’t have again for another 30 years. After the two-year WASP “experiment,” women were not permitted to attend military pilot training in the U.S. armed forces again until the late 1970s. By then, the WASP were still a little-known part of the nation’s history; but they had proven that women could fly military aircraft when their country needed them. Their example laid the groundwork for “revolutionary reform in the integration of women pilots into the Armed Services,” the bill notes. In 1993, the WASP were cited during congressional hearings that eventually led to women being able to fly military fighter, bomber, and attack aircraft in combat. Meanwhile, the WASP went on to have careers and families after their service. Many continued flying. Dickerson, who opened a flight school with her husband after the war, accumulated close to 5,000 hours of flying over the course of her long career. Now 87, she is among fewer than 300 WASP alive today. The bill under consideration would bestow the Congressional Gold Medal on those women and the families of those who have died. 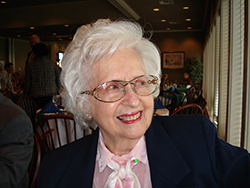 Parrish and her mother, WASP Deanie Parrish, have beencollecting interviews with all the remaining WASP through their organization Wings Across America. 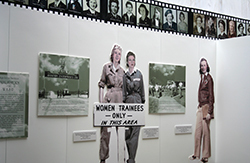 So far, they have documented the stories of 110 women and worked on the creation of the National WASP WWII Museum in Sweetwater, where a large portion of the WASP trained. 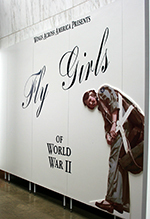 Wings Across America also created the exhibit “Fly Girls of WWII” that went on display at Arlington National Cemetery’s Women In Military Service for America Memorial in November, and the organization has been promoting S.614. Nancy is not the only proponent of S.614 who has been inspired by the example of the WASP. At the opening of the exhibit, Air Force Maj. Nichole Malachowski, the first female pilot in the U.S. Air Force Air Demonstration Squadron “Thunderbirds,” spoke about how the legacy of the WASP inspired her to pursue her dream of flying. Malachowski, a White House Fellow, worked with Wings Across America to take the idea of the bill to Hutchison, who had written about the WASP in her 2004 book, American Heroines: The Spirited Women Who Shaped Our Country. Hutchison introduced S.614 on the Senate floor on behalf of all 17 women senators March 17.